Avoid exercise before and after a dive. Exercise before will make your tissues hungry for oxygen and so load them with nitrogen on a dive, Exercise after will increase the rate of nitrogen washout causing more and bigger bubbles. Alcohol will dehydrate you the next day, make sure you drink plenty of water before sleeping if you have been over doing the cocktails the night before. No diver should dive whilst under the influence of alcohol as its effects lead to lack of co-ordination, mental reasoning and potentially unconsciousness. Cigarette smoke contains carbon monoxide (CO), which is a poisonous gas that is odourless, tasteless and colourless. An increased level of CO in a smoker will reduce the ability of the red blood cells to carry oxygen. In addition, Cigarette smoke also contains nicotine, which acts as a vasoconstrictor and may therefore increase the risk of DCS. It is the longer-term issues with smoking and diving that is of greater risk. This includes chronic obstructive pulmonary disease (COPD) that leads to reduced oxygen availability and an increase in carbon dioxide (CO2) retention in the body. This has been implicated as a factor in CNS oxygen toxicity. A diver should avoid being too cold on a dive and should ensure that they are wearing appropriate equipment and clothing for the diving conditions. If you are cold your peripheral blood vessels shut down and thereby slowing down their nitrogen release. Divers are often planning repetitive dives, particularly whilst on holiday and on liveaboards. The depth and duration of each dive will influence the amount of nitrogen absorbed by the body. After each dive the body will retain some of the inert gas (nitrogen) dissolved in the tissues which will, in time, be excreted through the lungs. 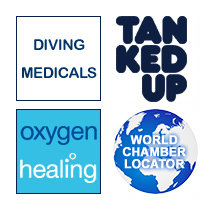 Repetitive diving will increase the chances of decompression illness, so it is important to allow enough time between each dive for nitrogen to off-load. As fatty tissue absorbs more nitrogen than muscle and at a rate 5 times that of muscle tissue, obesity is a pre-disposing factor to decompression illness. Divers should try to maintain a fit and healthy lifestyle. This will not only help them avoid decompression illness but also enable them to enjoy the highly physical sport of scuba diving more. Research has shown there may be a link with women diving whilst menstruating and getting DCI. Dive conservatively if it is that time of the cycle. The best way to dehydrate is to sit top deck of a liveaboard, drink coffee and forget about the wind dehydration factor. So don't do it. If your urine is pale yellow, you are OK, if it is that dark Van Gogh sunflower yellow, drink more water. Diarrohoea will reduce your circulating fluid volume so reducing your capacity to off-gas after a dive.